These questions will stem from McIlroy’s withdrawal from the Honda Classic last Friday, in which he was the defending champion. 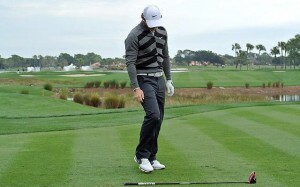 It wasn’t just that McIlroy withdrew, it was the reason (or lack thereof) behind it. After carding a first round score of even par 70, McIlroy got off to a horrible start during his second round on Friday at PGA National, which included at double bogey, and a triple bogey in his first eight holes. On his ninth hole, McIlroy informed his playing partners that he was done for the day, and subsequently done for the tournament. A group of reporters caught up to McIlroy as he was leaving to get in his car where the golfer reportedly told them that he was ‘in a bad state mentally.’ A couple hours later though, McIlroy released a statement alluding to pain in his mouth from wisdom teeth, that was affecting his concentration, and his ability to make a swing. It’s simply the fact about the late-arriving reason that will draw some tough questions. McIlroy will be playing this week, and is scheduled to have his wisdom teeth out in the near future. This is just the latest event in what has been a poor start to the 2013 season for the top-ranked player. It started with a missed cut at the HSBC Championship, which has been followed by a first-round exit at the Accenture Match Play, and then the early withdrawal at the Honda Classic. In total, McIlroy has played just about two rounds on the 2013 PGA Tour. The WGC Cadillac Championship does not have a cut, so McIlroy will be in the field for the four days, and it will be interesting to see if he is able to get anything going. You can bet he will be the top story coming into the week, which doesn’t happen often in a week that Tiger Woods will be in the field. Woods’ also didn’t have a great performance at the honda Classic, finishing in a tie for 37th. But that has been largely overshadowed by the expectation for McIlroy coming to TPC blue monster this week. McIlroy has a history of getting off to fast starts early in the season, and has not been able to do that so far. And with the Masters just about a month away, it’s crunch time.